Highlight Homes offers the very best in architectural and interior design services. With more than a quarter century in the architectural industry, we have the expertise to fully design residential and commercial properties to fit the growing needs of your family or business. We can also design smaller projects such as room additions and home renovations – so that it meets not only your vision but also the specific structural requirements of your pre-existing home. We use good, old-fashioned know-how and creativity paired with the latest technological advances through ACAD Architecture Design software to fashion our distinctive, original designs. In doing so, we are able to increase our productivity ten-fold – so that we are better prepared to move you from the design phase to the construction phase rapidly. That way, you don’t have to wait any longer to see your dreams become a reality. While we are hard at work on the construction phase, you can enjoy choosing the elements that will make the project complete. 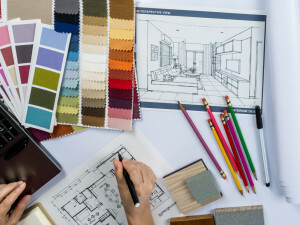 Our gifted interior design team will help guide you through the selection of colors, flooring, appliances and materials that will aid in the final transformation of a room to a living space or a house to a home. The designers that comprise our interior design team are hand-picked for their talent and experience, and each shares in the Highlight Homes philosophy of providing nothing but the very best service to our clients while adding special, distinctive touches that will make your home entirely unique and all-your-own.